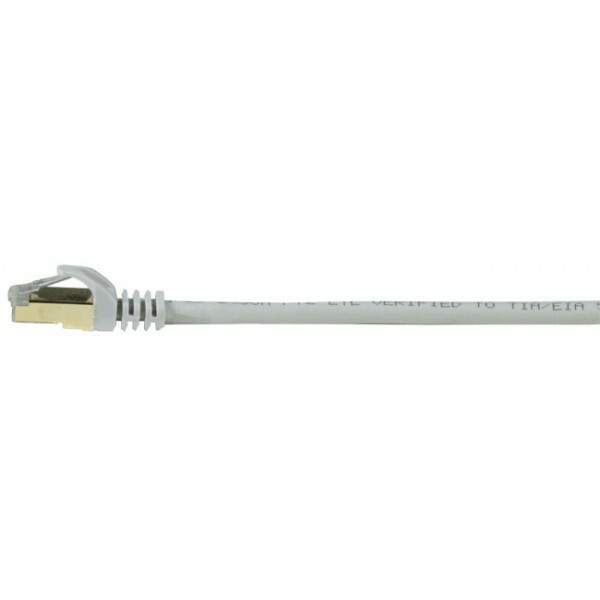 28AWG CAT7 stranded SSTP gray Ethernet network cables. Category 7/Class F (ISO/IEC 11801) cable specifications require transmission frequencies of up to 600 MHz over 100 meters of fully shielded copper cabling. CAT7 cables consist of four individually shielded pairs inside an overall braided shield, also known as Shielded Twisted Pair Cable (SSTP), or S/FTP (Shielded Foil Twisted Pair). CAT7 industrial cables feature even more stringent specifications for crosstalk and system noise than CAT6, and is designed specifically for Gigabit Ethernet applications (Gigabit over copper) up to 75℃. Our VPCAT™ Premium CAT7 industrial cables exceed the current ISO/IEC specifications and represent the next generation in Ethernet over copper. Category 7 SSTP cable wired straight through. 28 AWG, gold plated 8x8 (RJ45) plugs. Low profile is ideal for high-density switch applications. 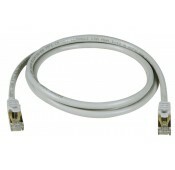 Backwards compatible with CAT5, CAT5e, CAT6, and CAT6a equipment. Patch cords have stranded copper conductors for flexibility - great for frequent changes that occur at the wall outlet or patch panel. Virtually eliminates alien crosstalk and interference. Performance rated beyond 600 MHz. Patch cables & boots are the same color; boots are snagless.